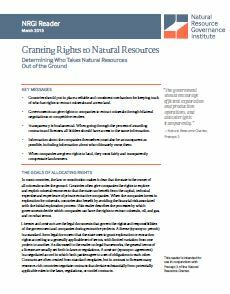 P3 What are Natural Resource Charter precepts? Countries should put in place a reliable and consistent mechanism for keeping track of who has rights to extract minerals and access land. Governments can give rights to companies to extract minerals through bilateral negotiations or competitive tenders. Transparency is fundamental. When going through the process of awarding contracts and licenses, all bidders should have access to the same information. Information about the companies themselves must also be as transparent as possible, including information about who ultimately owns them. When companies are given rights to land, they must fairly and transparently compensate landowners.